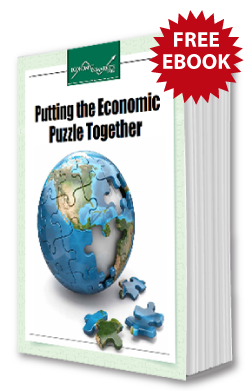 Put All the Pieces of the Economic Puzzle Together with Economy & Markets' New FREE EBook! All you need to know about gold as it pertains to the dollar, inflation and the so-called "currency crisis"
And more! From gold, to real estate, to the dollar, this eBook contains everything you need to know in order to survive and prosper in today's turbulent economic climate. Important note: By submitting my e-mail, I give permission to receive newsletters, updates and offers from Economy & Markets. We do not sell your information and you can unsubscribe at any time. "I love the Economy & Markets e-mails. It is a dangerous investing world and Economy & Markets e-mails make more sense to me than anything." "I follow Economy and Markets and the Boom and Bust newsletter and I have to say I trust you all. I feel Dent Research is the only company that knows what’s happening in the world. I just wish I had more money to invest in more of the recommendations that I’m given." "No one looks at what demographics can predict, but I love how you do. You are our go-to when it comes to planning our future and financing. We love it"
Since then, Harry and his business partner Rodney Johnson have been using this New Science of financial market research to accurately identify booms and busts well ahead of the mainstream. They gained national attention for their work in warning investors of the 2008 credit crisis and subsequent economic collapse and market collapse, many months before it happened. But this was not the first time they were “on the money” with their big picture forecasts. For example, in 1989 Harry accurately forecast the Japanese economic collapse and the multi-decade depression in Japan that would follow. He also called a Dow Jones of 10,000 by the early 2000’s at a time when most economists, politicians, businessmen, analysts and investors were expecting the exact opposite. The Dow Jones broke the 10,000 barrier for the first time on April 5, 1999. While most economists focus on short-term trends… policy changes… technical indicators… elections – things that are volatile, unstable and can change from day-to-day – Harry focus on long-term trends. Demographic trends. Business cycles. Market cycles. Economic Cycles. Human behavior patterns. Purchasing Power. Things that have demonstrated themselves over hundreds (even thousands) of years to be consistent, predictable and measurable.